2/12/19 John Dade, High Ridge Futures, Is your Networking Net Working? 2/12/19 Mark Meyer, AFLAC, Why Supplemental Benefits Exist? 4/9/19 Ron Rhodes, SunSolar US, Solar Power and River Rafts...Solar Powered River Rafting? 5/14/19 Dana Hindman, Free Wheelchair Mission, How a Wheelchair can make a Difference? 5/14/19 Deeann Elder, Healthy Chocolate, Why Chocolates truly are life's gifts? 6/11/19 Cathie Peterson, When Best to Professionally Send Out Cards and Gifts? 6/11/19 Jeannine Arrington, Legal Shield, How to Save Your Personal Identity? 9/10/19 Thomas Lotts, New York Life, How you can Protect Your Business in the 21st Century? 11/12/19 Hani Ascha, SelectFirst Insurance Services, Why Select Second in Insurance Choices? 12/10/19 John Dade, Cigar Afficionado, How to Puff Up Your Business without Smoking? 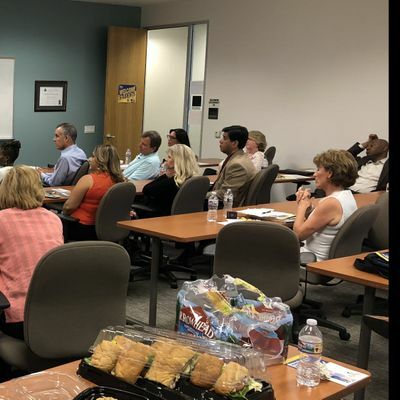 1/14/2020 Johnny Tai, Mueller Prost CPAs & Business Advisors, How an Inc Magazine Nation's Top 1000 Fastest Growing Company Helps Small-to-Mid-Sized Businesses Grow? 1/14/2020 Donna Lang Stoffel, Heightened Health, What is Physiovascular Therapy?